There are many methods and techniques of setting up, preparing the soil and maintaining a garden. None are right, wrong or best. Most of these “new” methods are actually not new at all, but we have become more aware of these methods because of the importance and awareness of permaculture and sustainability. Permaculture is nothing more than putting in practice a method of gardening that develops a natural ecosystem with diversity of life that will result in sustainable agricultural production. Let’s just say that is is currently considered correct to grow your own food while nourishing the soil, insects, microorganisms and wildlife that will naturally help keep your garden healthy, and to cause a s little disturbance as possible to those same things when you initially set up your garden and as you maintain it. Once good practices are put in place, healthy soil will continue to grow along with wonderful produce. THAT, is sustainability. It is important to select a method that works best for you and prepare a garden that suits you, your soil, your site, as well as your visual preference. You will also need to consider the space you have available. Do you have a large or small area available? Do you primarily have deck or patio space? Do you have any physical limitations? What tools do you have available or are you willing to purchase? A method that makes a gardener happy makes a gardener productive. So for now, let’s just take a look at the general methods and how they work. Once you settle on the method that is best for you, additional knowledge and information will be helpful, and you will also learn a lot as your garden progresses. There is no magic in a a method, there will still be some trial and error before you develop specifically what works best for you, your soil, your site and the produce that you want to grow. The true Lasagne Gardening method goes beyond layering of compost materials to build better soil. In theory it is a no dig method that is highly productive and eliminates weeding. The first layer, which goes right on top of your sod or whatever happens to be in your chosen site, is a thick layer of newspaper or even cardboard. Lightly spray the paper to moisten it and start adding layers of brown and green compostable materials. The brown layers should be about twice as deep as the green. Keep layering to about two feet deep, it will decompose and compact dramatically in a few to several weeks. This must be allowed to decompose over winter. If you prepare a lasagne garden in spring with the intention of planting right away, you must also layer a substantial mound of topsoil or finished compost along with the greens and browns. Testers have found the method satisfactory, however it will take a few years to truly develop ideal soil and even longer to begin to improve the underlying soil. If hardpan existed when you started, it will continue to exist. You can see more detail about the method: Lasagne Gardening. Similar in many ways to lasagne gardening, the Ruth Stout system starts with a t least an 8 inch layer of compostable matter on your chosen garden site. She likes to use large volumes of spoiled hay. This thick mulch is simply maintained year round with any compostable material as it is acquired. The material rots and enriches the underlying soil over time. You don’t need to compost anything, it all goes right on top of the garden as is. Like the lasagne method, it takes a few years to develop ideal soil and hardpan will still exist. You should also first prepare the garden in fall to allow settling and decomposition. To see more detail about the method see: Deep Mulch Gardening. 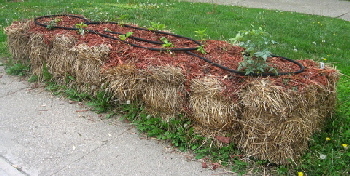 Straw bale gardening is essentially planting directly into a bale of straw (NOT hay). First you need to condition the bale by encouraging the bale to start to decompose with water and specific fertilizers. In three or four weeks you will add some potting mix to accommodate planting and away you go. Keeping the bale watered and weekly fertilizing is essential. By the time you start planting, the bale has heated up as it decomposes, then has begun to cool back down by the time you add your soil and plants or seeds. The temperature inside the bale can be 85 degrees when you plant and root development starts immediately. This is ideal for warm season crops like tomatoes, but success has not been good for peas and other cool season crops. For cold climate gardeners, that means you can plant earlier and expect better yields. Big advantage if you have a short growing season. You will need new bales each year, but the expense is relatively minimal and the old bale is now wonderful compost or mulch. To see more detail about this method see: Straw Bale Gardening. There are a great variety of ways you can prepare a mulch garden without digging. Lasagne, Ruth Stout and Straw Bale seem to be the most popular of the methods currently. Hugelkultur is gaining popularity also. Many gardeners are planting virtually in or around piles of mulch or compost, calling it Key Hole gardening among other things. I do think it is important to research not only the method if you choose to try, but also what the composition of your mulch or compost should be for the particular plants you grow. Some plants will do well in wood chips, some do best in straw. Stated simply, Hugelkultur is a raised bed of soil and compost mounded over rotting wood. There are variations on how to build one, and different reasons for why you might build one. If you have recently had trees taken down and like me, have a perpetual brush pile, you may have an ideal reason to build a Hugelkultur bed and put all that wood to good use. Hugelkultur is generally started in a trench or low spot, starting with the largest trunks on the bottom. Then cover the trunks, branches and brush with compost, manure and soil or even just build a compost pile on top of it all. Nitrogen rich material is important, as the decomposing wood consumes nitrogen. Water it all well to settle and begin the decomposing process. All that wood will hold so much water for such a long time that watering is virtually unnecessary after the first year of composting. The giant composting pile will also be very warm, facilitating early planting and will be naturally fertilzing your plants after the wood decomposes. If you have the right situation, check it out. Hugelkultur is supposed to be highly efficient, highly productive, and saves a lot money on watering and feeding. Intensive French Gardening was originally developed for small home gardeners with small spaces and limited tools. Therefore, the soil is deeply worked once to begin a garden (see Double Digging) and often makes use of raised beds. Soil amendments and compost are incorporated into the soil in the double digging process to provide ideal soil for deep roots to a depth of at least two feet. The work is all accomplished with hand tools, as a rototiller cannot reach deep enough into the soil. With deep rich soil that is never tread on, the garden can be productive for many many years with minimal effort. Compost is created separately and used to top dress the garden. Intensive French, double dug gardens are highly productive with little maintenance. This has always been my preferred method, partly because I have dense clay soil with hardpan. I also prefer to get microbes and insects active deep in the soil quickly to rapidly benefit the soil. In my short growing season, I love to start planting early in the spring with little or no prep. So a lot of hard work ONCE works for me. Hydroponic gardening is growing in water that is nutrient rich. Although I do understand that the soil itself is not necessary to grow food, that it simply holds and delivers water and nutrients to the plant, this very non-traditional means of growing food is hard for us old fashioned gardeners to accept. With that said, hydroponics seems to produce quickly and abundantly. It also greatly reduces the total us of water and the need for pesticides. Hydroponics is complicated so I won’t even try to get into the how to here. This is a very space intensive method of gardening that requires light, nutrient rich soil. The plants are packed in very close and staked up or trellised to take advantage of vertical space. Typically done in a raised bed which is helpful if you have physical limitations. The soil must be replaced or largely amended each season to support a large number of plants in such a small space. The nutrients will likely be completely exhausted even before the end of the growing season, requiring supplemental fertilizing to maintain the plants. Quite simply, raised beds are constructed with walls from a variety of available materials. Then soil is added to the contained bed. There are many benefits to a raised bed. If constructed high enough you can reach your plants with little or no bending over, nice if you have a bad back. Or you can sit on the walls to work. The soil in a raised bed warms up quickly in spring to accommodate earlier planting, drains well and dries more quickly than ground level soil. Nutrient rich soil is used to fill the bed so you don’t have to worry about your bad soil or tilling every year, however a shallow bed may not be enough depending on the condition of your existing soil. Till up the soil and add compost before filling the bed if necessary. There seems to be an endless supply of ideas lately about how to grow vertically. From pre-constructed freestanding garden walls with pockets or troughs to simple trellises in the ground or in containers, you can find an ideal way to suit your limited space. Upright trays, racks, walls, pocket gardens and containers of course need to be filled with container mix rather than topsoil and cared for like container gardens. Trellises and plant supports can be used in the ground to keep all your plants as upright and vertical as possible, consuming very little ground space per plant. This method of vertical gardening is heavily used in square foot gardening. Ideal for apartment dwellers or gardening on your deck or patio, container gardening has become easier and easier. Dwarf plants are readily available perfect for containers. And a great variety of self watering containers and elaborate container “systems” are available to purchase. Or you can construct your own from instructions found online. You will need soil formulated specifically for containers. Like square foot gardening, the soil will be quickly depleted of nutrients and must be replaced each year. The final decision you will need to make is will you garden organically? If you have decided to embrace sustainable gardening and permaculture, you will likely prefer to also garden organically. Organic gardening eliminates the use of chemicals and pesticides in favor of early friendly natural alternatives. Most organic home gardeners admit to occasionally using a chemical or pesticide in a “desperate” situation. I have more concern about the use of pesticides than chemical fertilizers because of the harm it causes to our beneficial insects, which we need to help manage those desperate situations with harmful insects. The whole point of this article is to help YOU decide what will work best for YOU. I will, however, point out a few things about the methods. Deep Mulch and Lasagne methods make it more difficult to direct seed. Deep Mulch and Lasagne both prevent weeds from sprouting, but can also sprout weeds from the material used because it has not been hot composted. Certain weeds are so tenacious that they will grow through literally anything. I like to make sure that such weeds are completely removed when prepping a garden bed. Poor soil under the bed will take years and years and years to improve, so a raised bed needs to be pretty darn deep. Hardpan is not dealt with in most of these methods. The only way to deal with hardpan is to break through it or build up new soil substantially. You will need at least 2 feet of malleable soil to grow tomatoes and root vegetables. That is one big mound of lasagne! As for hydroponics, it requires fairly expensive equipment and a good deal of learning to get started. If you can prepare a bed at least a couple of years before use, Deep Mulch and Lasagne are ideal systems to produce good soil and good gardens. Deep Mulch, Lasagne and Straw Bale gardening are water efficient. Hard work is virtually eliminated with Deep Mulch, Straw Bale and Lasagne methods. The never ending job of composting is eliminated if not dramatically reduced with self mulched methods. Even though I tend to prefer the old fashioned double dig method of preparing a garden bed because of my clay and hardpan, I have been incorporating some of the sustainable ideas in established beds. And I do think I will try straw bale gardening next year! Now this is an example of what I mean when I say “find what works for you and your site”. My four large raised bed fruit and vegetable gardens became over run with maple tree roots and I was forced to abandon the beds a couple of years ago. I rearranged and consolidated my cutting garden to make room for vegetables but I still don’t have enough room to grow everything I want. The abandoned beds are in the sunniest part of the gardens and prime space is being wasted. Well, those straw bales will be perfect for the spot! Can’t wait to see how it works out for me!